Small Batch Brownies are easy to bake in your air fryer when you want a sweet treat. There’s no need to make your kitchen hot from the oven. 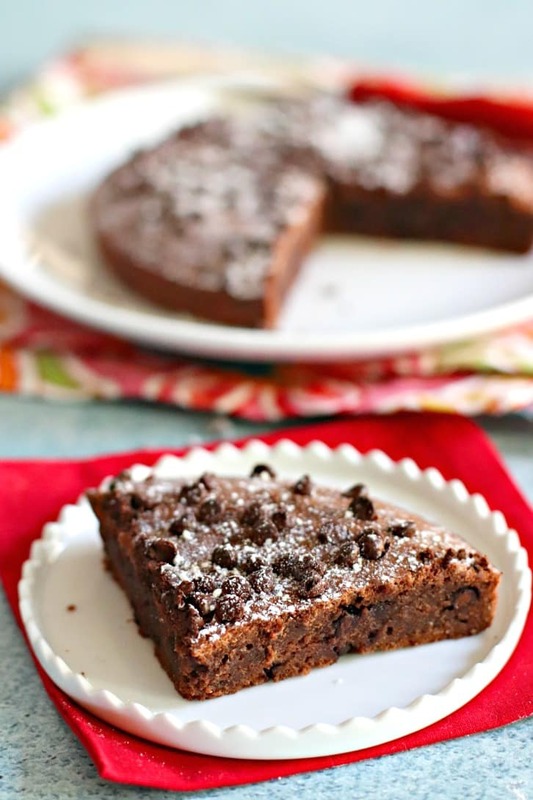 And these brownies are vegan with gluten-free and oil-free options. Did you know you make desserts in an air fryer? 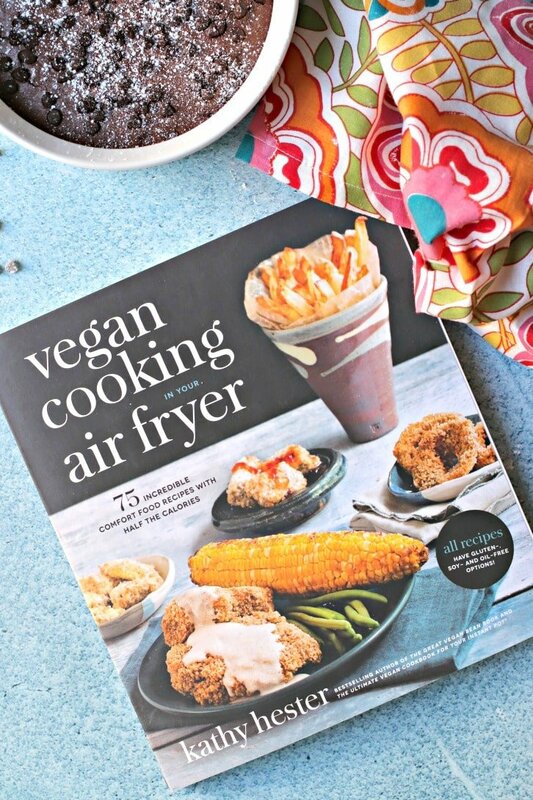 I admit I never would have thought of trying it until I saw my friend Kathy Hester’s cookbook Vegan Cooking in Your Air Fryer: 75 Incredible Comfort Food Recipes with Half the Calories. 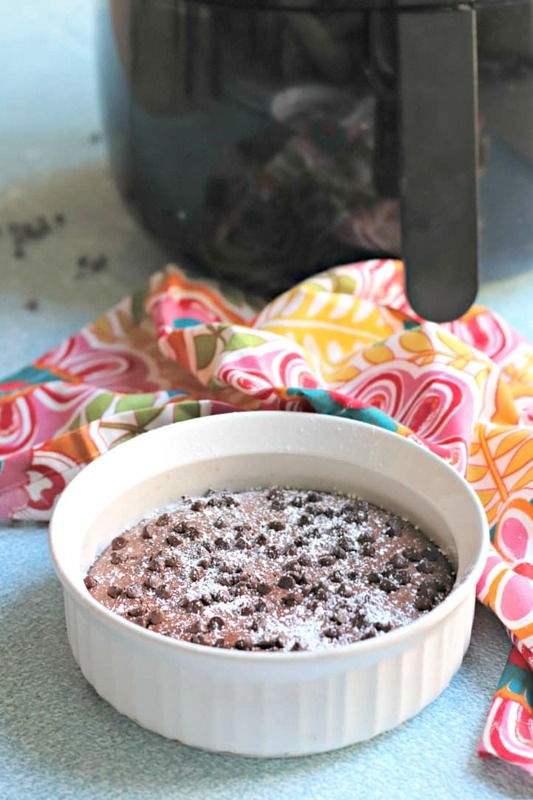 You may be thinking to yourself, why would I want to make dessert in my air fryer? The air fryer doesn’t heat up your kitchen like your oven does. 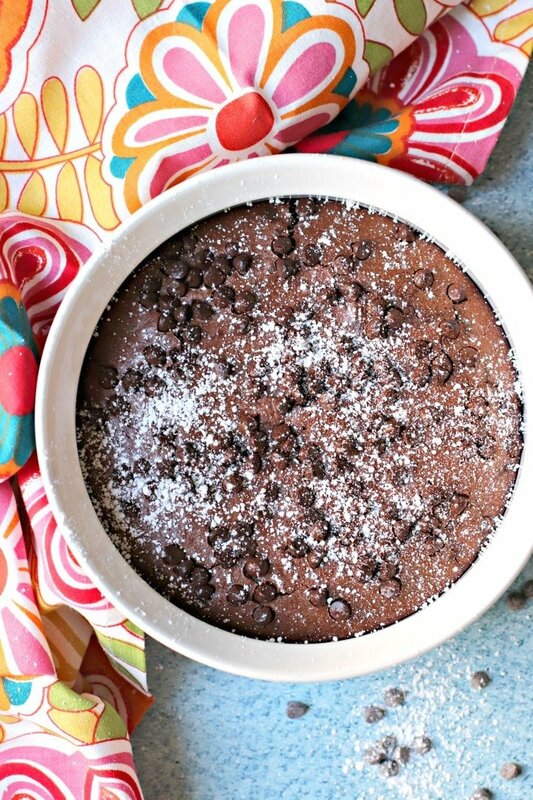 So during the peak of summer, you can bake your favorite treats and stay comfortable. Using the air fryer is a good way to control portion size. Sometimes I don’t want a whole cake or pan of brownies tempting me for days. It’s amazing what you can make in an air fryer! If you own an air fryer, you may have tried recipes such as Potato Wedges or Crispy Tofu, but Kathy shows us in her book that we can use it for a lot more. But don’t worry if you don’t have much experience using an air fryer. Kathy breaks it down and answers all the questions you may have. Some of my favorites are the Crunchy Cajun Chickpeas, Becky Striepe’s Magic Avocado Fries, and Lime Corn on the Cobb. And I’m really looking forward to trying the Potato Kofta with an Easy Creamy Curry Sauce (Aloo Kofta), Crispy Coconut Tofu Nuggets, and Battered Onion Rings. Another thing I love about Vegan Cooking in Your Air Fryer is that most of the recipes can be made gluten-free and oil-free. Small Batch Brownies are easy to make gluten-free and oil-free. I used Bob’s Red Mill Gluten Free 1-to-1 Baking Flour and didn’t need to make any adjustments to the recipe. And as my mix-in, I added Enjoy Life Mini Chocolate Chips. I also added a dusting of powdered sugar after I removed the baking dish from my Philips Air Fryer. Now let’s make Small Batch Brownies In Your Air Fryer! Everyone loves brownies and in our house, we love them a little too much. With that said, I've started making small batches that we can't get in trouble with eating too many. It's a bonus that the air fry doesn't heat up your whole house like an oven, so it's a delicious dessert to make for summer dinner parties. Mix the dry ingredients together in one bowl. Then mix the wet ingredients in a large measuring cup. Add the wet to the dry and mix well. Preheat your air fryer to 350 degrees (or as close as your air fryer gets). Either spray some oil on a 5-inch cake or pie round pan (or a loaf pan that fits in your air fryer), or line it with parchment paper to keep it completely oil-free. Recipe from Vegan Cooking in Your Air Fryer by Kathy Hester. Reprinted by permission of Page Street Publishing. Ooh these are definitely on my to make list. I’m loving this book! Kathy is a wizard. I love this book, too! Kathy is so talented. I’ve made a ton of recipes from this book, but I haven’t made this one yet! 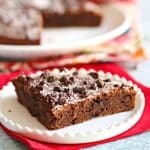 I need to make it soon – these brownies look amazing! It’s a really good recipe! I know you’ll enjoy it, Dianne. Wow, these brownies look like perfection! That’s such a good point about being able to control portion size. That’s something that dissuades me from making dessert usually since we’re just a household of two humans. This sounds like an amazing after dinner treat! Exactly! The last thing I want is extra food that will go to waste if I don’t eat it. Who wouldn’t want small batch brownies–??? They look great. And love the ease and simplicity of the air fryer method! Thanks Ricki! I love it, too. For someone like me who doesn’t bake much, it’s a really easy recipe! I had no idea you could bake in an airfryer but I guess it makes sense. Will be trying these ASAP! It’s pretty amazing what the air fryer can do! I used this biggest ceramic dish that would fit in my air fryer. The size will vary depending on your brand and model. I hope that helps! i loved making it. asolutely amazing .